Below is the somewhat desperate begging letter from Theresa May to the British electorate seeking to by-pass Parliament, who as it stands today after the announcement of the EU President Dodald Tusk that the EU 27 members have accepted the draft agreement, are all too likely to turn down the sell out. Perhaps our politicians should be reminded this is not some silly ‘Deal-NO-Deal’ game show the British peoples have spoken clearly in the excercising of their democratic rights in a Peoples Vote and said NO DEAL they wanted by a clear majority in the largest vote in Britain’s history to Leave-The-EU. I note Noel Edmonds, the presenter of the presciently named game show, has shipped out to Australia to make a fool of himself for a sub moronic culture of voyeurs, in I’m a Sleb get me out of here! Perhaps we should send Theresa May and her advisers and supporters to join them as they have proved of no use in the defence nor the democracy of Britain. This failing deal seems as if the EU is all too happy to accept £Billions, initially £39Bn., from Britain, movement of EU people to Britain to be funded on our benefits structure and our prisons, their benefits alone last year were £500,000,000 and control of how and with whom Britain trades locked into the deal and the effective brerak up of these United Kingdoms by the EU dictating how Northern Ireland will function and ensuring Britain ends up with an open border to the EU via Northern Ireland. That this would in effect mean Britain has a worse deal than the vassal status we held as members of tyheir sham democracy with its armies of unelected buyreaucrats in control. Worse on the points above but also0 in that we would have absolutely no say in making EU laws which would automaticly effect Britain. It is even claimed that by Spain that Britain would be forced to share Sovereignty of Gibraltar with Spain – one wonders if Spain will be sharing sovereignty of its African straits territories with Morrocco! That Spain has acted with all the sympatico & tact one would have expected of their brutal and pompose Dictator Franco – is unsurprising, one is all too aware of Spain’s utter contempt for democracy as so clearly shown by its brutal repression of its Catalan and Basque peoples in recent years. It must be understood that it is firmly on record that the EU have stipulated that in leaving the EU in any way Britain must be shown to have derived no advantage – not a bad principle for ones enemies to impose on one! Many will remember it was largely as a result of France’s insistance on full reparations and controls of Germany laid down in the Versailles Treaty ending World War I that France sewed the seeds that were harvested by us all in the inevitability of World War II. It is now time for Parliament to reject this sordid sell out and set to work to act honourably to ensure a total uncoupling from the economic, political and militaristic ambitions of the remaining EU. It is possible, all be it difficult, even at this late stage for the Government to give its backing to a Private Member’s Bill seeking an accomodation with EFTA and the EEA, where much to the surprise of many such Countries as Norway and Switzerland have reached independent agreements with the EU collectively that enpower them with some say and various vetos in the EU’s law making process where they are at liberty to adopt those that are expedient and those that benefit them and reject others. I never thought that, on the eve of the special European Council, I would be stricken with a degree of tedium so profound that you could hack off slabs and use it to pave the back yard. This whole damn Brexit thing has gone on too long, with too many ups and downs. One is exhausted by it all. It’s not made any better by the realisation that, whatever rituals the EU-27 choose to perform today, the outcome is a foregone conclusion but no longer decisive. 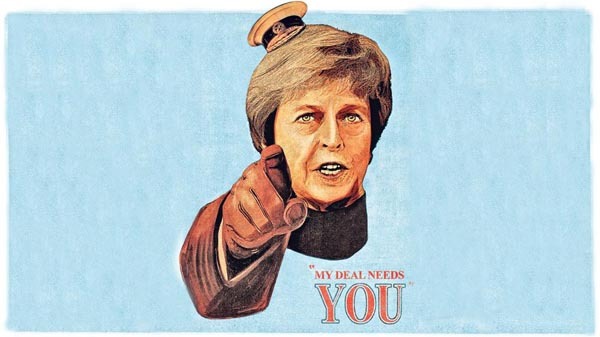 For the moment, the fate of the “deal” rests not upon EU leaders but the fractious, ill-informed men and women of Westminster who will vote it down – or not. As to the eventual outcome of that fracas, one can speculate but serious prediction is unwise. There are too many variables, too many people involved and enough sub-plots to keep a soap opera going for a decade. And once one factors in the range of responses and the reactions to them, the chances of making a correct call are slight. My own guesses, however, are a matter of record. MPs will want to play their games, slapping down the deal to make whatever points they want to make. And then Mrs May will do whatever she does, and parliament will come to heel, allowing the prime minister her victory. If that doesn’t happen, there is talk of Mrs May scuttling back to Brussels to ask for more concessions on the “backstop”, even if there is nothing there to give. But that doesn’t stop the Telegraph coming up with its own fantasy, under the headline: “Secret ‘Plan B’ for Brexit: Cabinet and EU plot 11th-hour alternatives to Theresa May’s deal”. Ostensibly, this should be something we would welcome as the paper – relying as usual on anonymous “sources” – tells of several senior ministers “talking up” a “Plan B idea” of a Norway-style relationship with Brussels. What precisely that means is by no means clear, although we are told that the UK would have a more certain “exit mechanism” from the EU’s rules but would be unable to end the free movement of workers from the Continent. We are then referred to a leaked “government document” which “reveals” economic modelling by the Treasury. This is supposedly designed to allow MPs to compare Mrs May’s deal to a no-deal exit, but it also includes an “EEA-like scenario”, which is taken to indicate that the arrangement is “being considered seriously in Whitehall”. Whether coincidence, or not, yesterday saw an article in Conservative Home by Nick Hargrave, a former Downing Street special adviser, extolling the virtues of an EEA deal. “If we join the EEA, others might follow – thus creating a Europe-wide, non-federalist alternative to the EU”, his headline runs, rather omitting the slight detail that we are already in the EEA. But Hargrave’s thesis is that, with the UK in place, other EU Member States might also come on board. This would create “a bloc with heightened economic weight, with the UK as a key influence”, which would then “have greater flexibility to negotiate with the likes of France and Germany over issues such as immigration and budgetary contributions”. Yet, in this whole piece, there is not a single mention of Efta, nor the inconvenient problem of getting the existing four states to fall in with our ambitions. Once again, we see this extraordinary Tory arrogance in assuming that these countries will roll over and welcome the UK unconditionally into the fold. Nor indeed from Hargrave – nor from the Telegraph in its speculative piece – is there any hint of the complexity of the process of adapting the EEA Agreement to suit the UK’s special requirements, and the need for add-on treaties with the EU to cement in a working relationship. What is interesting though, is that, of the current negotiated deal, Hargrave argues that once you strip away all the bluster and political framing, our lengthy transition period with the EU is likely to end up as a form of “EEA minus”. That much I had considered as a possibility in yesterday’s piece, although such an eventuality is far from a foregone conclusion. Bluntly, at this late stage, I do not see any realistic possibility of the UK transferring to Efta/EEA membership in the time available. For this to happen, we would need a considerable extension to the Article 50 period, something we are unlikely to get. For all that, though, if Mrs May does pursue the regulatory alignment identified in the Political Declaration, it would mean that we would effectively be shadowing the EEA acquis. More realistically, it would then be open to us to re-apply to join Efta and through that membership, participation in the EEA – without the pressure of time constraints. Those who happily chirp that Flexcit is “dead” thus need to realise that there is no time in the future that we cannot trigger the Efta/EEA process. And the closer we remain aligned to the acquis, the less problematical that would be. From there, if we follow the Flexcit phasing, we would be looking to work with the existing Efta members to bring the EEA closer to the original concept of the European Economic Space, a “European village” of co-equals with shared decision-making. In days past, the objection to the EU’s Single Market was that it was a continuation of the EU’s use of economic integration to pursue political integration. Facilitating trade was always the secondary objective, which rendered the EU’s initiatives inherently untrustworthy. In the longer term, therefore, it is essential that the management and development of the Single Market is removed from Brussels. This would leave the EU to pursue its political agenda without having to compromise trade legislation. Our choice in Flexcit of the United Nations Economic Commission Europe (UNECE) was the most appropriate, as this organisation is already well-practised in managing trade facilitation measures. But, in pursuing this line, it was always intended that we would be working with the Efta States. The first target might be to bring Switzerland back into the EEA fold, prior to its eventual abolition. All this might be ambitious but it also amounts to something of the vision that has so far been lacking from the Brexit process. The idea of a genuine pan-European trade area, embracing all the countries of Europe (including Russia), is one that is worth fighting for. In the shorter term, the necessary objective is that we secure full withdrawal from the EU. And there, if the Political Declaration offers a realistic possibility of concluding a future relationship with the EU which keeps our option open, then it might be worth pursuing, despite the serious reservations on the withdrawal agreement. Meanwhile, Mrs May does herself no favours with an open letter to Britain, published in a number of newspapers today. Trotting out the usual mantras, she entirely conforms with her “Maybot” image, seemingly incapable of talking like a human being. In another coincidence, though, writing in The Sunday times, we have Tony Blair with his own version of an open letter, this one to “EU leaders”. Of Mrs May’s deal, he says that the Brexit people think it’s a betrayal. The remainers like him think it is completely pointless. The British people, he says, are naturally confused by it all. “But once they know it is keeping us tied to Europe but losing our say, it will be deeply unpopular”. Mr Blair’s way out is that parliament “votes down this mess”. But he then wants his “EU leaders” to “step forward with an offer which deals with the principal British anxieties about Europe”. Naturally, he excludes “those of the Brexit fanatics”, but concedes that British “anxieties” are also European ones, “especially around immigration”. And then he wants another referendum. Seemingly, in this letter, the former prime minister has achieved the near-impossible – by contrast, he has almost made Mrs May sound plausible. The problem is that “almost” doesn’t cut it. We have a long way to go before we see the vision necessary to enthuse the peoples of the United Kingdom.